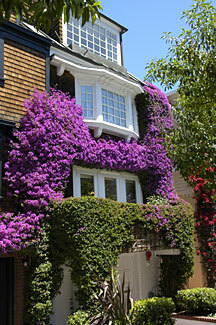 Gorgeous bougainvillea vines are in full bloom and cover the brown shingled façade. 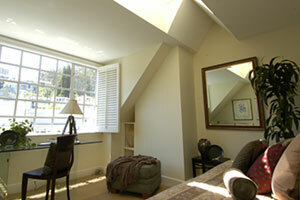 The home has a light and airy contemporary ambience in updated excellent condition. The major rooms with two large decks enjoy the romantic views of the Bay, from the Golden Gate Bridge to the Palace of Fine Arts and Alcatraz Island. Union and Chestnut Street shopping and dining are conveniently located nearby as well as Presidio Park for play and outdoor activities.. The light view LIVING ROOM features an impressive two-story ceiling with expansive picture windows, stone fireplace and dining area. French doors open to the expansive north view DECK with glass railing overlooking the landscaped north GARDEN and sparkling water views. A charming spiral staircase makes for easy access to the lush garden. 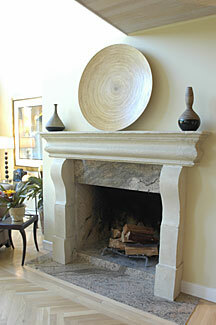 The open SITTING ROOM off the entry hall may also be used as a formal DINING ROOM. The sunny gourmet KITCHEN features granite countertops, custom cabinets with glass fronts, work island with bar seats and herringbone hardwood floor. Appliances include: a US Commercial cook top, built-in brick grill, ventilator, double oven, Sub-Zero refrigerator/freezer and dishwasher. Step out to the south facing front balcony surrounded by bougainvillea and a view of the pretty tree-lined street and cityscape. 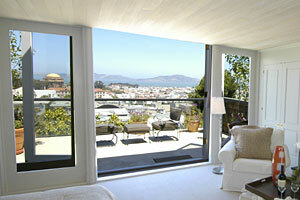 The south facing front BEDROOM with skylight takes in the cityscape of Pacific Heights. An adjoining bath is shared with the center BEDROOM. The MASTER BEDROOM with fireplace enjoys the stunning Bay view encompassing the Golden Gate Bridge, Palace of Fine Arts & Alcatraz Island. 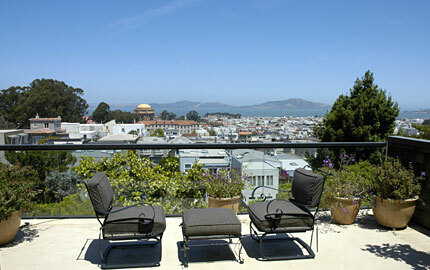 Step out to the large view deck with glass railing. The luxurious MASTER BATH has a black granite surround, mirrored vanity, shower and separate WC; adjoining large walk-in closet makes for abundance of space for today’s needs. The sunny front HOME OFFICE with south facing city view may be used as a bedroom. 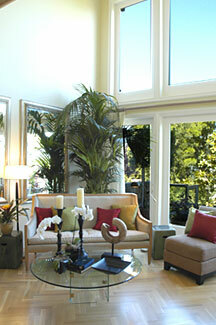 FAMILY ROOM with GARDEN outlook. Convenient kitchenette with bar refrigerator. A tiled full BATH adjoins. This level also would serve as an ideal au pair or guest quarters. Two car tandem GARAGE with inside access, LAUNDRY area & additional storage. Access to the charming, secluded GARDEN with camelia & rose bushes, seasonal blooms and a brick walkway to the wood bench built around the enormous Magnolia tree. In the back of the garden a charming Green House or ideal Play House for the youngsters in the family.